We also surveyed and interviewed folks with school-age kids in our newsroom. We did this because of an empathy gap — nobody on the news apps team has school-age kids. Along the way, we learned much about our users and much about the usability (or lack thereof!) 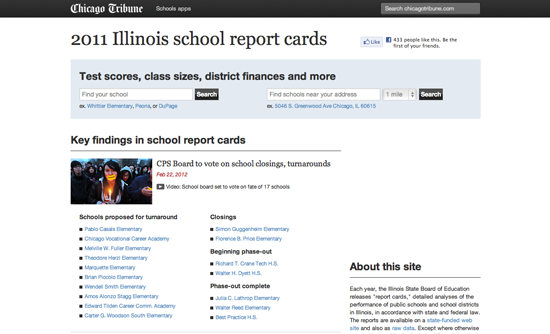 of the previous version of our schools site. We aimed to design for a couple specific users and use cases: (1) parents with a child in school who want to know how their school measures up, and (2) parents who’re trying to sort out where to live, since school quality often has a major impact on that decision. A key piece of this project was information design. Although we present far less data than is available, it’s still a lot of data, and making it digestible was a challenge. Luckily, we got to borrow someone from our graphics desk — a designer who specialises in presenting complicated information. He taught us much about chart design and, in general, guided us to a presentation that is readable, but does not underestimate the reader’s ability or desire to understand the numbers. We experimented for the first time with Twitter’s Bootstrap user interface framework on this project, and were happy with the results. The charts are drawn with Flot. Early reports are that readers love the schools app. The feedback we’ve received has been largely positive (or at least constructive! ), and page views are through the roof. As a bonus, this data will remain interesting for a full year, so although we expect the hits to tail off as the schools stories fade from the homepage, our past experience is that readers have sought out this application year-round. The graphics desk is your friend. They’re good at making complex information digestible. Ask the newsroom for help. This is the second project for which we’ve conducted a newsroom-wide survey and interviews, and it’s a great way to get the opinion of thoughtful people who, like our audience, are diverse in background and generally uncomfortable with computers. Show your work! Much of our feedback has been requests for the data that the application. We’ve made a lot of the data publicly available via an API, and we will shortly release the stuff that we didn’t think to include initially.